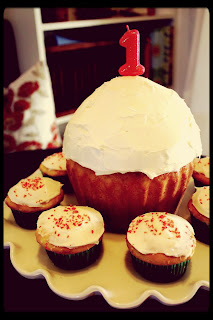 Our little boy is turning one! Strange as it may seem, there was a part of me (OK, let's be real - the whole me) that thought this day would never come. That our little man would stay little forever. Denial? Perhaps. Well, earth-to-mom - time only starts moving faster after having kids. After I got over the initial shock that this day was indeed upon us, it was onto the fun part - planning a memorable (and inexpensive) get-together to celebrate Will's big day. I wanted to keep it low-key and fun - aka. not turn it into an overly orchestrated Martha Stewart-esque party that would stress me out - but in typical fashion I needed to let the creative wheels turn at least a little bit. My goals with the party were 1) fun for Will and the attending kids, 2) fun for me to plan and not too much work and 3) of course, cheap! I'm happy to report that the party was all of the above and more. It was one of those special days that we'll never forget (especially not with all the photos snapped and videos taped), and it was relaxed enough for all of us to enjoy it - including the birthday boy and mom. From budget to decorations to - of course - the cake, below are what I hope are helpful tips on how to throw a fun and frugal birthday party. Timing: Less is more. We hosted our party from 1:30 - 3:30 and that allowed us plenty of time to enjoy the moment and then wrap things up before the kids got too tired. The timing fit with Will's nap schedule and that of his friends (although it's impossible to accommodate everyone), and also meant that we wouldn't need to do lunch (thus saving money and mommy's sanity). Budget: I gave myself a $100 budget to throw the party and made it work. How did I do it? Here is the breakdown. Food: I easily could have gone overboard here and had to reign myself in a few times. I made three types of tea sandwiches that were also kid friendly - hummus and roasted red pepper on wheat ($5), cheese and fig spread on wheat ($8), and cucumber, cream cheese and dill on white bread ($5). Other than that, I kept it really simple and put out some cheese cubes ($2), grape tomatoes ($3) and chips ($2). After all, what guests are really looking forward to is the cake. Drinks: We got a 12 pack of beer ($12), apple juice ($2), ginger ale ($1) and sparkling water ($2). We avoided drinks with bright colors, thus no worrying about stains on the carpet. Decorations: This is a flexible part of the budget because you can do as little or as much as you want - for me, this is where I wanted to have a little fun. I bought the necessities (plates for $3 and napkins for $2), hats ($2), balloons ($5 filled), and a cute felt 'Happy Birthday' sign at Target for $5 (there is no way I could have made that for less). 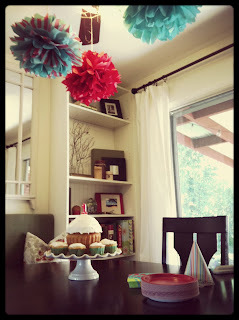 To add a little extra pizazz, I made and hung tissue paper pom poms around the house for a grand total of $4 (really, more like $2 as I didn't use all of the paper). Kids' activities: Keep it simple! I had some crayons and paper as back-up, but didn't need them as cake and the opening of presents offered plenty of excitement. Goody bags: I certainly didn't need these for a first birthday party, but found some cupcake themed goody bags on sale at World Market for $2 that I couldn't pass up. I added some rubber duckies for $1 a piece and voila - done. Planning: This is my type A personality talking, but I found it helpful to spread the to-do list out over the week so that I didn't feel overwhelmed come Friday/Saturday. As in decorate house on Wednesday, make grocery list on Thursday, shop and bake cake on Friday, etc. A little forethought here went a long way because Lord knows life is unpredictable with a soon-to-be one-year-old! Video and Photos: Get some help here! You simply can't do it all and play host at the same time - not to mention that the guest of honor is going to need a lot of your attention throughout the whole party. Ask two friends or family members to help with photos and video and let them know what you want them to capture - like your little one stuffing cake in his or her mouth (or eating crumbs off the floor...just saying...) or ripping up wrapping paper. Have fun! Above all, once the day arrives go with the flow and don't sweat the small stuff. The most important thing is to enjoy the company of family and friends and help your little one feel at ease. The more relaxed you are, the most relaxed everyone - including the birthday boy or girl - will be. Being new to kids' parties, I'd love to hear other ideas for budget-friendly birthdays. From food to themes to cake to activities, please chime in with your comments!